One of the things I hate more than anything in the world are hypermasculine, manly-man stereotypes. I can’t stand them, and I do everything in my power to subvert them whenever possible. So when I got an email about a service called Man Crates, you can understand that my first reaction was…umm…what? Now, this is not a sponsored post, and I have never actually received a Man Crate. But the idea of a Loot Crate-style goodie box that you have to open with a crowbar? I think that’s pretty neato, masculine branding aside. So when their rep said they were doing a project on video-game nostalgia, I figured I’d join in. Because you know what led me to this very point in my life? Getting an Atari 2600 when I was 2 years old. So yeah. I can talk about gaming nostalgia. Okay, to be completely honest, I have no idea if I was still in diapers at 2. I probably was, but that’s neither here nor there. What I know for sure, though, is that I had a joystick in my hand at that age. It was 1985, and the Nintendo Entertainment System was brand-spanking-new. I saw commercials on TV and thought it was awesome. At 2 years old, I recognized how great video games were when I saw them on TV. Unfortunately, my parents couldn’t accord a Nintendo. They were expensive ($199, I think), and in 1985 that was a lot of money. So instead, they had my cousin Kip give me his old, unwanted Atari 2600, two joysticks, and a shoebox full of cartridges. Keep in mind, this is the mid-80s and multiple TV sets in a house is not common. So in order to play this wonderbox, my dad set up a 13-inch, black-and-white portable TV. I was in heaven. My parents and I played Moon Patrol, Pong, Space Invaders, Galaga, Pac-Man, and every other awesome Atari game you can think of. I have no idea if I was any good at them or who won or how long we played. My memory of this time consists of me and both my parents sitting in front of a tiny black-and-white box taking turns playing each other. It was awesome. It’s one of the most soothing and comforting memories I have. To this day, when I see any of those old Atari games or hear any of the sound effects, I can just about feel the way that old joystick felt in my hand as it moved. But my parents couldn’t always indulge me. They couldn’t always sit and play video games with their adorable, prodigy of a toddler. I was left to my own devices with this newfound box of awesome. I remember sitting in our back room in front of that 2600 console, rooting through the shoebox of games, trying one after another until I found the one that could keep my attention the longest. Then it happened. I found the one title that shaped my gaming tastes to this very day–Adventure. It was amazing. I was a square, just roaming around this maze, finding treasure and slaying dragons. I remember the first time I beat Adventure. I was so excited that I jumped up and down and went screaming into the other room to tell my mom about it. Then I went back and beat it again. And again. And again. And again. Over and over. In black-and-white. At 2 years old. I was in love with roleplaying games from the very beginning. It didn’t matter there was no story. I felt like my little square-knight was the greatest hero in history. In some ways, I still do. I still don’t recognize Adventure when I see it in color. I found the screenshot above, and I almost put a monochrome filter on it just so it would look like my version of the game. I have a very specific memory of my first RPG, and the Internet really doesn’t even archive it. Other people, who also hold Adventure close to their hearts, don’t even have the memories that I do of it. It isn’t like in World of Warcraft. I have a lot of great memories about killing raid bosses, but those are shared with 25 to 40 other people. My experience 30 years ago with Adventure is mine. And mine alone. If my family hadn’t been too poor to afford a Nintendo, I’d never have that. If we’d had a color TV to hook the Atari into, I’d never have that. If my cousin Kip hadn’t bought Adventure and put it into the shoebox, I’d never have that. So for me, video game nostalgia is a very personal thing, which is something I sorely miss in today’s online gaming culture. My first memories of gaming are filled with childhood wonder and a sense of accomplishment and terrific achievement. They’re filled with the love of a family playing games together and laughing. But most of all, they’re made up of a tiny black-and-white screen, a joystick, and a square. So that’s why the retro gamer Man Crate seems so awesome to me. They try to box up the systems and consoles that most of us have memories of. For me, they don’t go back far enough. Sure, I have lots of awesome memories about my NES and SNES that I could ramble on about for pages. I’d adore getting an NES or SNES in a crate with a crowbar–or pretty much any of the other geek-themed Man Crates. If I pried that out of a box, I swear to you folks that the hypermasculine, manly-man stereotype would be subverted. I would be so weepy that you’d think I just watched Aeris die all over again–but that’s another bit of nostalgia for another time. What is your most nostalgic video game memory? Oh, wow. That is reaching back! We were not a video game house. We most certainly did not have a gaming system of any kind, and it was a glorious day when I finally got a GameBoy. With Tetris. Because you know. You learn things from Tetris. However, I did have one of the early Macintosh PCs and I did have and play Zork. I don’t think I ever beat it, but I love typing those commands in. Until I got stuck in the dark cellar and eaten by whatever scary thing lurked down there. I loved old text-based games. I never got through Zork, either. I’ve read Ready Player One a couple times this past year, and there is a whole section re-enacting Zork. It makes me want to play it so badly. My text-based games were all MUDs once I got online in middle-school. I couldn’t get enough of exploring these worlds and fighting monsters with text commands! I am like you–one of the most glorious days of my life was when I finally got that Game Boy with Tetris. I still have it around somewhere in my storage room, too. I’ll never let that thing go. Ahhh such awesomeness! I never played Adventure but I tore through my Atari E.T. The Extra Terrestrial game. Oh and Breakout and Space Invaders. When we go to Disney, we literally spend hours at Disney Quest and their “classic” arcade games. We get to relive a little bit of our childhood and play a ton of classic games that we loved! Ahh. We didn’t have any gaming systems (we had 8 kids in our family–my parents couldn’t afford it! 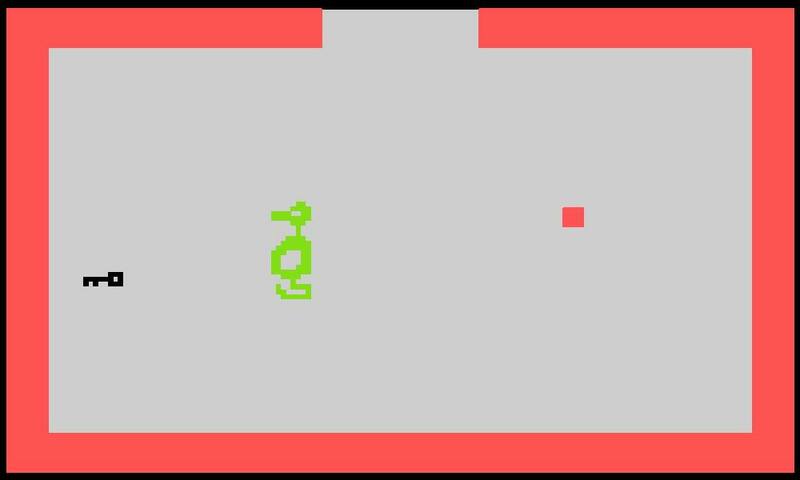 ), but when we went to my grandparents’ house, we got to play their Atari! I loved Frogger, Seaquest, and Jungle Hunt. 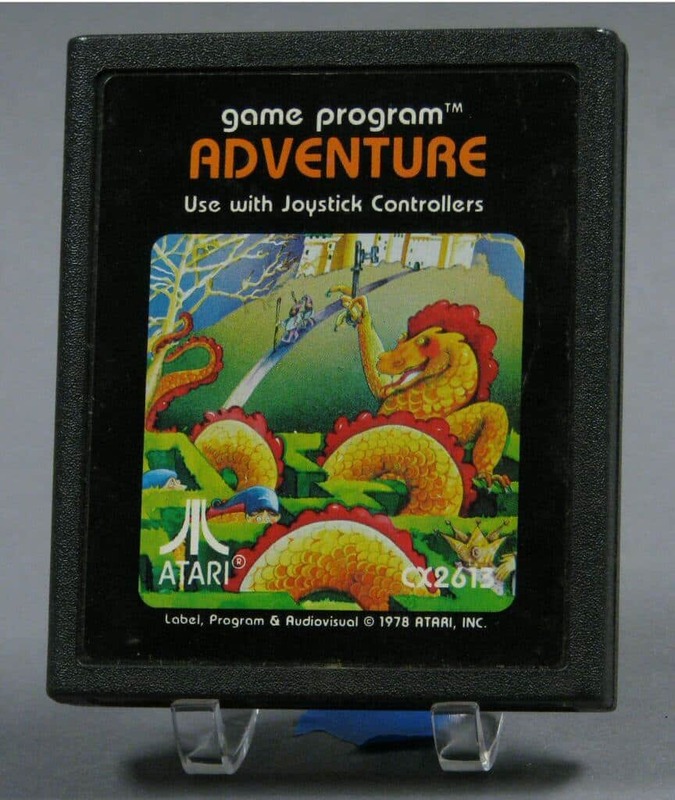 I never played Adventure (my grandparents’ stash of cartridges was limited). I am so jealous! Mine so had the two dials on the side, too! Sigh…I loved Atari 2600. My best friend and I had Pac-Man and Breakout tournaments. At night, with the lights off, I would play Night Driver or Haunted House. But Adventure was my favorite. Maybe the dragons looked like ducks, but I still loved slaying Grundle and getting away from Rhindle. That bat drove me nuts and I thought the catacombs were a great idea. So many secret rooms and rules for placing objects. It really was a pretty developed game for its time.